The Beauty of Giving Luncheon is a “must attend” event, celebrating philanthropy in the beauty industry and drawing an audience of 600+ industry professionals and leaders. 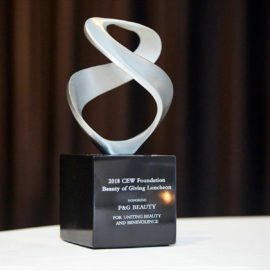 The longest running of all CEW events, the Beauty of Giving Luncheon is also one of the most popular, offering the opportunity to support a good cause while networking with colleagues. The high point of the luncheon is hearing from a survivor who has personally benefitted from services Cancer and Careers provides. The event also includes a live auction filled with luxurious trips and other one-of-a-kind experiences. Cancer and Careers empowers and educates people with cancer to thrive in their workplaces by providing expert advice, interactive tools and educational events—all free-of-charge. 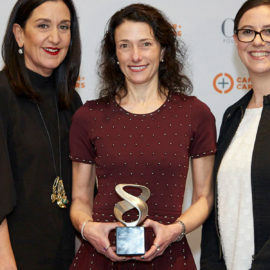 The Cosmetic Executive Women Foundation launched Cancer and Careers in 2001 after being inspired by CEW Board members who faced the challenges of balancing work after a cancer diagnosis. For information about Beauty of Giving Luncheon sponsorship opportunities or to purchase tickets or tables, please contact Michael Corrente, Senior Director of Development and Strategic Partnerships at mcorrente@cew.org or 646-929-8048.